In the early 1990s, Biodiesel was introduced as a diesel alternative in the Midwestern region of the United States. Although the alternative fuel was originally developed by Rudolf Diesel in the 1890s, it took nearly a century to gain popularity in the United States due to the availability and low cost of Petroleum for most of the 20th century. Today, environmental legislation coupled with rising prices of crude oil has spurred renewed interest in biofuels as an alternative energy source. As research continues to develop and the need and value for biodiesel increased, additional states have quickly expressed an interest in the renewable fuel. Biodiesel is made from vegetable oils, animal fats and recycled restaurant grease, all of which claim to produce less pollution than regular diesel. It is also largely compatible with petroleum-based diesel fuel and can be less expensive to synthesize, making it an important alternative energy source for the future. During the mixing process, biodiesel is synthesized by replacing glycerol with a short chain alcohol such as methanol or ethanol. This step is called ‘trans esterification’. Pumps are an important part of this process and the processes that take place after the biodiesel is synthesized. Air Operated Double Diaphragm (AODD) pump types are frequently chosen for these applications because of their ability to withstand the rigors of batch processing and continuous operation. 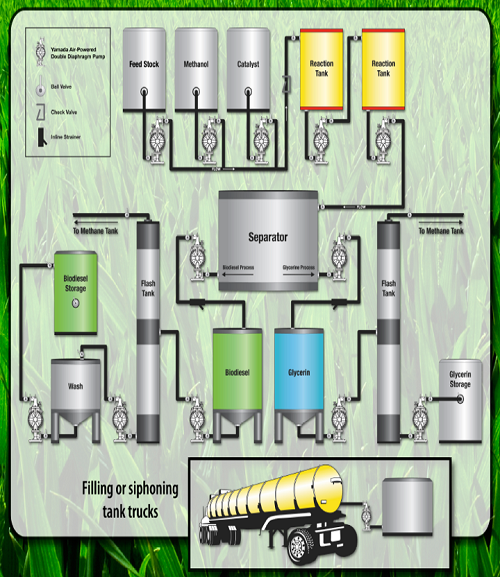 AODD pumps are ideal for transferring glycerin byproduct from holding tanks to tanker trucks, during the re-circulation process and as a vacuum pump to recover methanol during the re-use process; these are only a few of the applications in the biodiesel market that AODD pumps can handle. Handles a wide variety of fluids with high solids content: The pump has no close fitting or rotating parts, so liquid with high solids content and/or size is easily pumped. Self priming: The Yamada® AODD pump design incorporates internal check valves that allows for high suction lift even at dry start-up and with heavier fluids. Ability to run dry: No close fittings or sliding parts are at risk–the pump can run dry without damage. Variable flow rate and discharge pressure: Yamada® AODD pumps will run at any setting within their operating range simply by adjusting the air inlet pressure and system conditions. One pump can fit a broad spectrum of applications. Portable/simple installation: Simply connect your air supply line and liquid lines and the pump is ready to perform; there are no complex controls to install and operate. Shear sensitive: Liquid is transferred gently and with minimal parts contact. Safe operation: AODD pumps are powered by compressed air and are intrinsically safe. Submersible: If external components are compatible, the pump can be submerged in the liquid by simply running the exhaust line above the liquid level. Constant pumping efficiency: There are no rotors, gears, or pistons, which wear over time and lead to the gradual decline in performance/flow rate. Yamada® is an AODD pump manufacturer with extensive knowledge of the biodiesel industry. The company also offers its pumps for the industrial, automotive fluid transfer, mining and chemical industries. Its pumps are able to handle flow rates to 215 GPM and pressure to 125 PSI. With more than 150 distributors worldwide, Yamada® is a global leader in the manufacturing of fluid handling products.